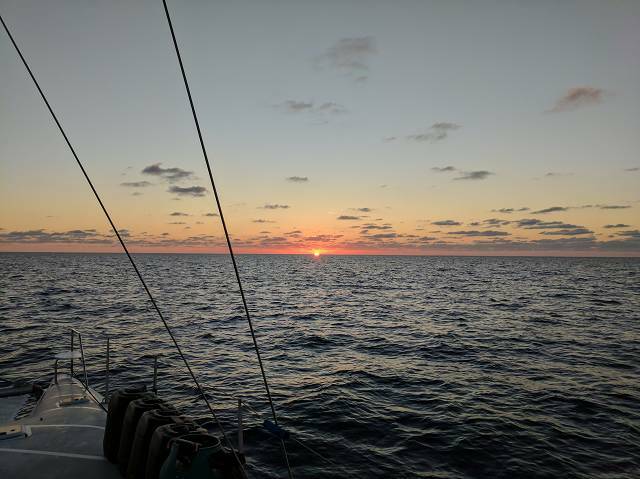 The sun is slowly setting in the west, as we sit calmly, anchored on the west side of Lynyard Cay. On the east side of the island (sorry, "cay" as it doesn't have any fresh water source), the Atlantic ocean pounds the shore. The warm breeze blowing from Africa comes over the trees and gently swings our boat. A few birds chirp as they flit from tree to tree, before settling down for the night. It's June 21st, summer solstice, and tomorrow we will be heading back to Grand Bahama Yacht Club in Freeport for a few days. But tonight it's one last chance to relax, and reflect on the last few days' adventures. Back in Marsh Harbour we met some interesting people. To begin with, a Chris White Atlantic 47 catamaran came sailing into the harbour and anchored nearby. Before we purchased Sail Quest, I had talked to Chris White about purchasing an Atlantic 47. They are truly amazing crafts. We passed it up for several reasons, but it was still a sight to see one, so we went over and introduced ourselves to the owners. As it turns out, this was boat number 4, and they now have boat number 9 on order. With only 7 currently in the water in the world, it really was pretty amazing to see one in person. The next person of interest we met was Steve Dodge, author of The Cruising Guide To The Abacos, the very book we were using while exploring this region. We had a good chat as well. It's really surprising how small the sailing community is, and how many people know each other. 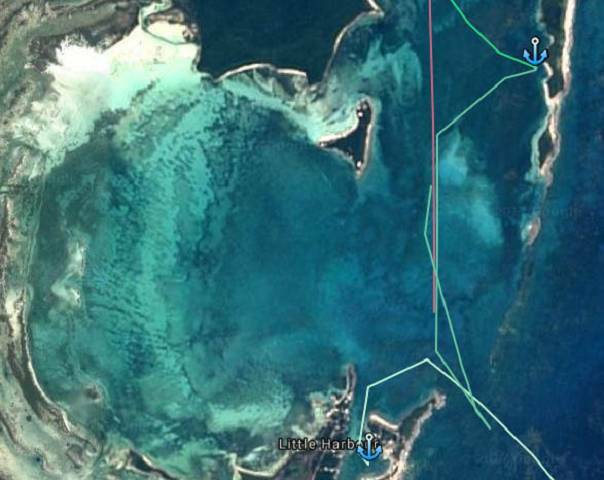 But on June 18th, we left Marsh Harbour and sailed here to Lynyard Cay. The next day, we wanted to head out. The south end of Lynyard Cay has a line of reefs heading to Abaco Island, with a short gap in the reefs known as the Little Harbour Cut. While sailing inside the Sea of Abaco is great in nearly all weather, getting in and out through the cuts can be a challenge. When the tide is heading out, and the waves are coming in, it can develop into what is called a rage. Normally when the 1 meter waves that are out in the ocean reach the shallow area, and can rise up to two meters or more. Add the tide and wind through a narrow cut and those 1 meter waves can become 3 to 4 meters. From a distance we could see that some of the waves were large, so we prepared the boat. Everything in the cockpit was brought inside, all hatches and windows were closed and secured, and Kyle and I donned our auto-inflate life jackets. These life jackets are also safety harnesses and we used our tethers to secure ourselves to the boat so we wouldn't be knocked overboard. We ran with the sails down and secured, and under both engines, as we approached the reef. The waves looked big, but safely do-able. As we started in to the cut it became apparent that the waves were larger than they appeared. As we crested them, nose pointing into the sky, it would lift us high and the nose would come down and we'd be aiming down the backside of the wave. Reaching the trough between the waves I realized that even from my helm position with my eyes 2.6 meters (8.5 feet) above the water surface, I could not see over the next wave. We were in some serious waves! With reefs on each side, there was no room to turn around and abort, we had to push through. Time, and time again, we rode up one wave, and down the back. Each wave slowed us on the rise, then sped us down the back. It took us nearly twenty minutes to get through the cut to where the reefs were behind us and the waves subsiding only slightly. Consulting with Kyle, we waited for the next wave to lift us up and got a good view of the ocean beyond. While the waves would subside to what would normally be an acceptable level, we were exhausted, and didn't feel like struggling the rest of the day. That left us one terrifying option, to turn and head back in. The trick was going to be getting the boat turned around between the waves. Having them come straight from the front, or straight from the back, was tolerable. But to have them coming from the side was very dangerous. We let two more waves pass us, and while on the crest of each, examined what was coming. We saw our opportunity, and waited. The wave picked us up, and as we reached the crest I spun the wheel hard over to the left, and pushed the starboard throttle forward to full. The boat turned left as we slid down into the trough. The next wave was small and hit us broadside, lifting the starboard hull only a little, then slamming the bridge deck as the starboard came down, before the port hull lifted and passed the wave under. The boat continued turning, agonizingly slowly, as the next big wave approached. We needed a 180 degree turn to put the waves directly behind us, and the passage ahead of us. We had made about 135 degrees as the next wave came on. Approaching now from 45 degrees off the stern, the starboard rear lifted, tilting the boat at a crazy angle as the wave lifted us higher and higher. With the water passing from behind us, the rudders were less effective and we sat 45 degrees off as the wave passed underneath us. Going down the wave now had our nose up in the air. Once at the bottom though we had a few seconds of calm water where the thrust from the one engine, combined with the rudders to get us turned the final bit, and we were straight on towards the cut... with the worst yet to come. I pushed the port engine up to full now to equalize the thrust, and we picked up speed heading towards the cut, with waves crashing on the reefs less than a hundred meters to each side. When we were heading out, each wave slowed us down, now they would be speeding us up. And to make matters worse, on the way out, into the waves, the water was passing our rudders from front to back, making them work properly. Now the water would be coming from behind us negating the rudders, leaving only our engine thrust to steer. The trip out was at about 3 knots into the waves, coming back we were doing 6 knots. The first wave came, and pushed us towards our cut. Our 6 knots increased to 7 before the wave crested under us, and we slowed down to 6 again as we rode down the back side. The next wave came bigger, lifting the back of the boat, and we were aiming down towards the water, surfing the wave at 8 knots. Once again, the crest passed us and we slowed a bit. Looking behind I could see the second wave back was big. Before it though we were again lifted from the stern, accelerating along with our nose down. Back up to 8 knots before the wave crested and we settled down in the trough. Now came the biggest wave yet. The back of the boat began lifting, and didn't stop. Up, up, and up. We sat on th front side of the wave, surfing down the wave as it accelerated us along. I looked at the instruments, and called out the speed to Kyle. "eight point two... eight point four... eight eight...", I called out, getting excited at our speed and acceleration. But it didn't stop there. "nine two... nine four... NINE SEVEN... NINE NINE!!! TEN FOUR!!! OH F%#K!!!" With a death grip on the wheel, we were moving too fast to look down at the instruments and I kept my eyes ahead as we shot between the reefs. Waves tearing into white foaming spray on each side, we continued, until finally, finally, the crest of the wave was under the center of the boat and the bows began lifting up again. We settled down the back side of the wave, and it was over. We were through the cut, and the remaining waves were nothing more than a meter. What took us twenty minutes to head out through, was less than five minutes returning. But it was a loooong five minutes! I throttled back, and turned on the autopilot, heading back to Lynyard Cay. 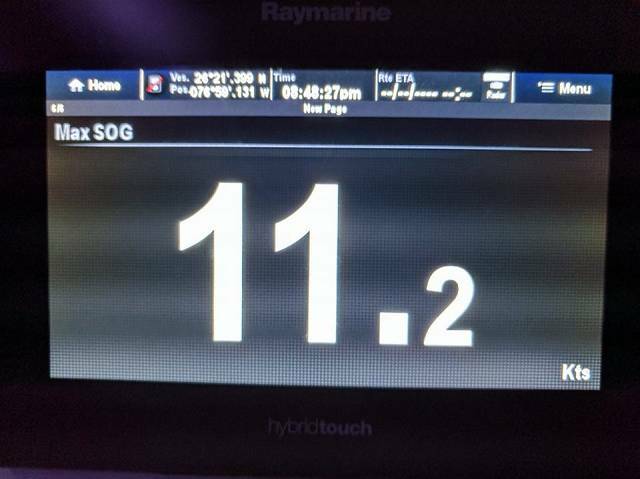 Once anchored near the beach again, we looked over the instruments and found that we reached up to 11.2 knots on that last wave. Now the lessons are learned. We know what to look for in cuts, and what should be attempted, and what shouldn't.